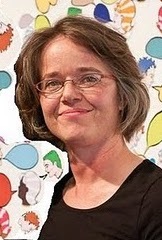 From all accounts, Molly Norris was a politically left-leaning cartoonist in Seattle who thought people just needed to lighten up a bit, and be able to freely express themselves, no matter what the topic. In 2010 Norris suggested a “Everybody Draw Mohammad Day.” A few days later she received her first death threat from a Muslim. The FBI told her she was in danger after Anwar al Awlaki told the Islamic world Norris was fair game for killing because she insulted Islam’s prophet Mohammad. Readers may remember Anwar al Awlaki was the former leader of the Dar al Hijra Islamic Center (mosque) in Falls Church, Virginia and former leader of Al Qaeda in Yemen until the U.S. dropped a missile on him and killed him in September 2011. He was the guy who gave talks in the U.S. Capitol, defended by the likes of NPR who said Awlaki was the new face of “moderate” Islam – before he wasn’t. The threat is real. 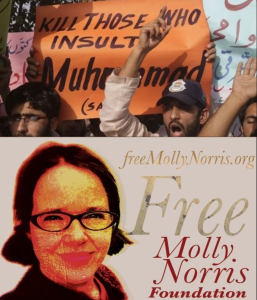 Al Qaeda has included Molly Norris on their list of “Most Wanted” in their publication “Inspire” magazine. Norris went into hiding and has not been seen since. She changed her identity without help from the government. Instead of destroying the Muslim Brotherhood’s Islamic/Jihadi Movement in the United States openly threatening a U.S. citizen and her God-given right to free expression, the government continues to “outreach” to the suit-wearing jihadis who advocate the same ideology as ISIS and Al Qaeda. Namely, in this case, the killing of anyone who “offends” them. Let’s see…how many of the people in the United States who publicly speak truth about Islam and the threat it poses have been directly threatened with bodily harm by muslims…oh, that’s right…all of them. The aborted global Islamist Movement’s* jihad sortie in Garland, Texas also stemmed from a competition involving Mohammad drawings, thus the violent wartime tactic its been using to deny free speech all over the planet for 14 centuries came into play. Furthermore, notwithstanding the contextual success of the FBI & local law-enforcement entities to prevent the loss of innocent lives in Garland, a cabal of Fox News quislings nonetheless attributed (on-air) all blame for said attack on the event’s main speaker, as opposed to the two deceased heavily-armed aspirational killers. *I.e., section-2 of the Keane commission’s final report identifies the 9/11 attacks on the United States as a “Declaration of War”, and notwithstanding the politically grounded assertions in the immediate aftermath of said inexplicable savagery — AND EVER SINCE — by self-serving liars that the global Islamist Movement represents a religion of “Peace”, that’s what it was intended to be, and still is — A WAR! Anyone who wishes to clarify exactly what the global Islamist Movement’s comprehensive war plan in actual fact means to their own safety, and to that of their family members, may secure a copy of the evidentiary document used by a U.S. District Court in Texas in connection with the convictions of members of the “Muslim Brotherhood in America”, I.e. a terrorist organization comprised of twenty-nine uniquely mandated battalions of jihadists dedicated to the literal destruction of the U.S. Constitutional system of government, and, indeed, the obliteration of Western Civilization: I.e. : GOVERNMENT EXHIBIT 003-0085/3:04-CR-240-G/U.S. v. HLF, et al is available for public consumption (for nominal cost) via http://www.securefreedom.org.